This breed has been around for thousands of years! It is the breed that you will notice on carvings in Egyptian hieroglyphs. In my opinion, it is a hound dog but shares a lot of its physical appearance with the Greyhound. Only physical difference is that the breed has the bushy tail and longer hairs over its extremities. In the United States this breed is not that common. It has a boundless amount of energy and if told to run a marathon, it would do that 100 times over and never get tired! Meaning, this is not a breed for apartment dwellers. The Saluki needs to run continuously. If the Saluki does not get the exercise it needs it can become obese, particularly after neutering. This breed is another example of making sure that you can provide the optimum environment for this dog to be happy and thrive. The breed needs a lot of attention and tons of space to exercise. Personality wise, they are intelligent dogs and good with families and children. 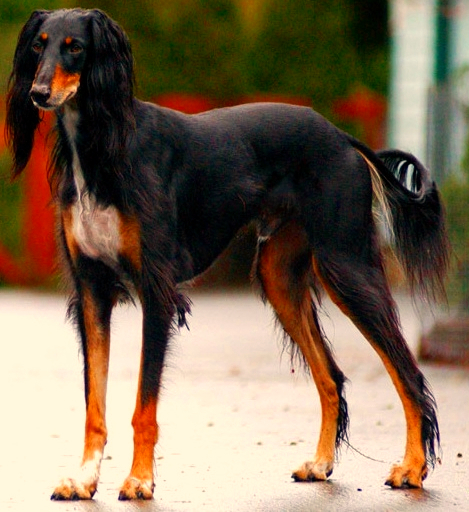 From my experience, the Saluki act like and are very similar to the Afghan Hound. Because of their floppy ears they are prone to ear infections. The breed is otherwise a healthy breed. Everyone gets sick every once in a while but the Saluki has been around for thousands of years. There are not really any specific ailments that point to the Saluki. A gentle, loving dog with more energy than a 2 year old!! Learn more about the Saluki at Animal Planet’s® Dog Breed Selector.